Shopping for Star Trek Pet Accessories? Give your dog his or her own captain's chair! Features faux-suede, a gold-embroidered insignia, and embroidered panels on its arms. Phasers are armed, Captain Pooch! With custom-shaped faux-suede, a gold embroidered insignia, and embroidered panels on its arms, this captain's chair is lovingly designed for the Star Trek fan and more importantly, that fan's lucky canine. The Star Trek Original Series Captain's Chair Dog Bed measures 32-inches wide x 27-inches long, so it's big enough for most dogs. Chances are, if you've been tripping on reruns of Star Trek, your beloved pooch has, too. 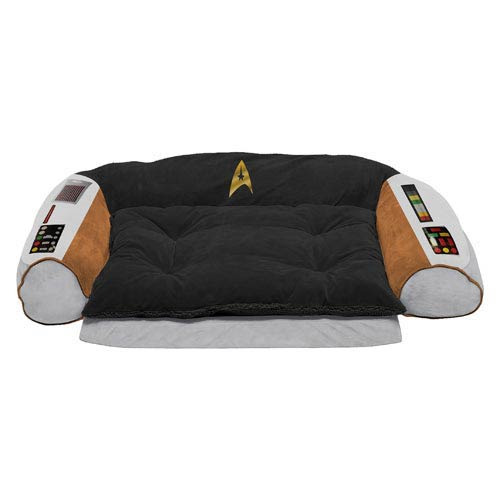 So, what better gift to give him or her than this super-comfortable Star Trek Original Series Captain's Chair Dog Bed?